Everett F. Harrison wrote this book in 1968 and it was published by Eerdmans. Harrison’s purpose for writing is to give an overall picture of Christ’s life but not dwell too much on the details. Harrison seems to be conservative in his basic positions on Christ i.e., His deity, atonement, and bodily resurrection and ascension. I think Harrison’s style of writing is very readable and I enjoy it but perhaps that’s because it is similar to many authors of his era. 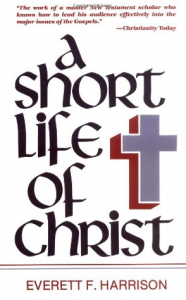 I would recommend this book for a good but brief overall look at the life of Christ.